This article is about the binder and promotional cards. For contained packs, see Legendary Collection 2: The Duel Academy Years Mega Pack. Legendary Collection 2: The Duel Academy Years is the second Legendary Collection binder. It comes with ten promotional cards, including the Sacred Beasts and cards from the Yu-Gi-Oh! GX manga. 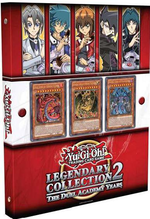 It also contains five packets of Legendary Collection 2: The Duel Academy Years Mega Pack. This collection was later reprinted in a box more similar to later releases in the Legendary Collection series, as Legendary Collection 2: Gameboard Edition. This set features reprints of the three Sacred Beasts, reprints of three members of the "Darklord" series which were previously exclusive prize cards, and seven TCG imports from the OCG set Premium Pack 12.